This 10,000 sq.ft. 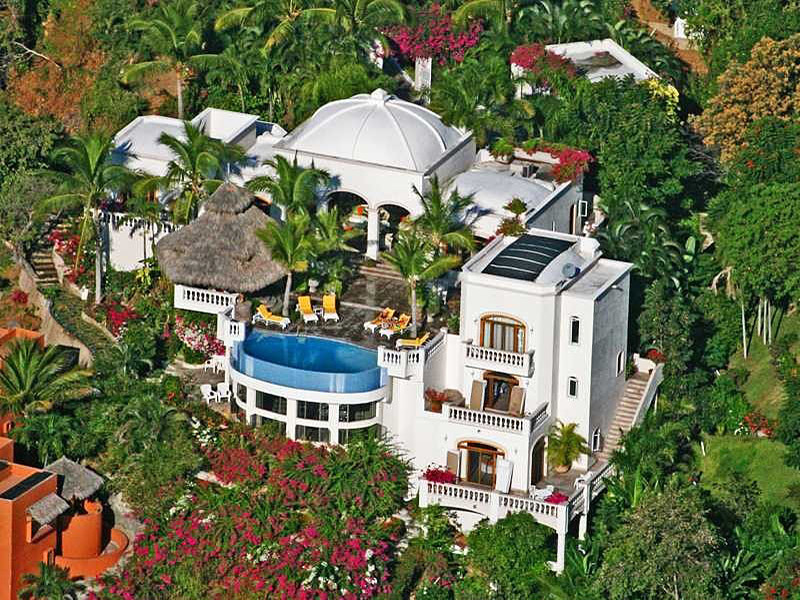 Mediterranean style villa on the shores of Mexico's Pacific Ocean, situated in the exclusive enclave of La Punta. La Punta is a master planned and gated community with full time security and located between the twin Bays of Manzanillo and Santiago. All suites in Villa Raffaella are air-conditioned, complemented by a ceiling fan, and equipped with en-suite bathroom and terrace. For formal dining, the villa offers seating for 12 in a refined dining room atmosphere, or make arrangements to dine allfresco under the huge palapa (thatched roof) adorned with magnificent views of the Pacific Ocean. As an added pleasure, you can access the ocean from the provate staircase of the villa. The large infinity pool which is surrounded by colorful bougainvilleas and lush vegetation is one of the highlights of the villa experience. Enjoy a cold drink or a Margarita while you sunbathe, read a book, or relax under the shade of the many palm trees. The cobblestone streets of La Punta, bordered by perfectly manicured landscaping, lead you to the private beach, club house and tennis courts which are reserved exclusively for residents and guests. A golf cart is provided, for your added convenience, to allow for easy transportation within the gated community. The appeal of all the amenities of this villa is enhanced by the dedication of our bilingual staff. Your meals will be deligently prepare with the freshest of ingredients, the house cleaned daily and meticulously, and your clothes will be washed and ironed with the utmost care. *Extra services such as massages, manicure, pedicure, personal trainer etc are available by request at an additional charge.